On December 17, 1903, the Wright brothers made the first powered, sustained, and controlled flight of an airplane. The modifier “controlled” is a crucial distinction, because there had been earlier attempts at flight that lacked that component. Those aviation pioneers were, presumably, identified by their dental records. Why, then, did the Wright brothers succeed when others had wound up creating debris fields? Encyclopedia Britannica states it succinctly: “The Wrights did not make the mistake common to many of their predecessors; i.e., to attempt powered flight without first learning to fly.” That seems like a fairly important detail, one that would be hard to overlook, but as we know, there are also lots of cars on our highways being operated by people who never learned to drive. The Wright brothers studied birds, then kites, then tethered gliders and eventually gliders in free flight. After all that research they felt they were finally ready to attempt powered flight with a man aboard. And who, you may ask, was that man? Even though that first flight is always credited to the Wright brothers collectively, obviously only one of them was aboard that flimsy little 600-pound biplane. The pilot on the first successful flight was Orville Wright, the younger brother. How was it decided that Orville should have the controls that day: superior hand-eye coordination, better “feel” for flight, paid-up life insurance policy? No, as with so many history-making events, it was random chance — a coin flip. That coin flip had been won several days earlier by Wilbur, as it turns out. He made the first attempt on December 14, and things didn’t go well. It took a couple of days to retrieve the broken parts and lash them back together. A modification was also made to the layout of the takeoff track at Kill Devil Hills. So now it was Orville’s turn, on a blustery day with 20 mph headwinds. “Go for it, bro,” Wilbur said. 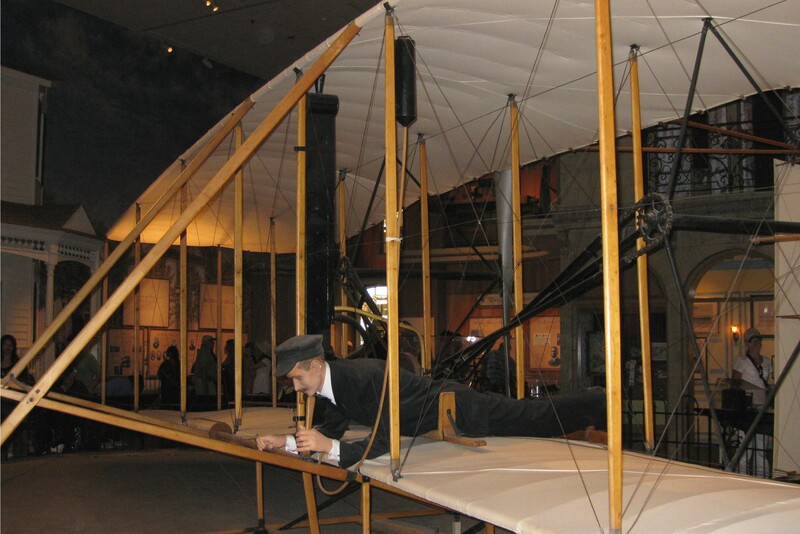 Orville’s historic flight gained an altitude of twenty feet, lasted twelve seconds, and covered a distance of 120 feet. The wing span of today’s 747-400 is 211 feet, by the way, so Orville could have taken off and landed on one. There were three subsequent flights that day; Wilbur, on the final attempt (around noon), stayed aloft for fifty-nine seconds and covered 852 feet. The Wrights were both lifelong bachelors so had no direct descendants, but their achievement that day left quite a legacy: long lines, missed connections, cramped seats, infuriating flight delays… in short, an industry so poorly managed that it needs government handouts to survive. Thanks, guys.